Just as medical, nursing, and allied health students have done for more than 40 years, you can depend on Dr. Wests classic text for learning respiratory physiology quickly, easily, and with no fluff. 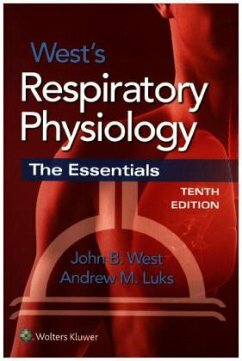 The 10th Edition of Wests Respiratory Physiology: The Essentials retains its outstanding qualities while also looking to the future of the field with the addition of Dr. Andrew Luks as co-author. Now updated and expanded to include clinical vignettes in each chapter, it also features new critical-thinking multiple-choice questions, videos based on the material in the book, and new information on key topics in respiratory physiology. In addition to its well-deserved reputation as the preferred text for students, this must-have resource is also ideal for residents and fellows in pulmonary medicine, anesthesiology, and internal medicine as an excellent review for exams and certifications. Multimedia resources are available online to enhance learning.